You may have heard of THE AQUABATS! Yes? Well now its your turn to help make the world as Un-Negative as possible by making your own Anti-Negativity Helmet! The MC Bat Commander just loves it when all the kids out there create their own costumes to wear to their shows. Plus you can wear it around anywhere and be SUPER RAD! "Aquacadets are encouraged to attend these events and the band's concerts in costume. These costumes often include official rashguards, helmets, belts, and masks that are available as part of the band's merchandise catalogue, but also often consist of homemade items. Some members have even formed splinter factions such as the "Astrobats," "Piratebats," and "Ninjabats" and outfitted themselves with homemade t-shirts and other apparel to show their support for the band." Also, I ask that you read the entire Instructable before you get too exited and just print out the templates and go. Enough blabbering, let's get going! The templates are just direct scans from a standard letter sized piece of printer paper. So, when you print make sure the image is the correct size. IMPORTANT NOTE: The smallest template(back) was about a half inch too short when I sewed my helmet. MAKE IT AN INCH LONGER WHEN YOU CUT OUT THE TEMPLATES! IMPORTANT NOTE: MAKE THE SMALLEST TEMPLATE AN INCH LONGER WHEN YOU CUT IT OUT! Tape the two long ones together. And label the side one. Line up where you need to trace and make sure you have plenty of space, and aren't going to overlap. 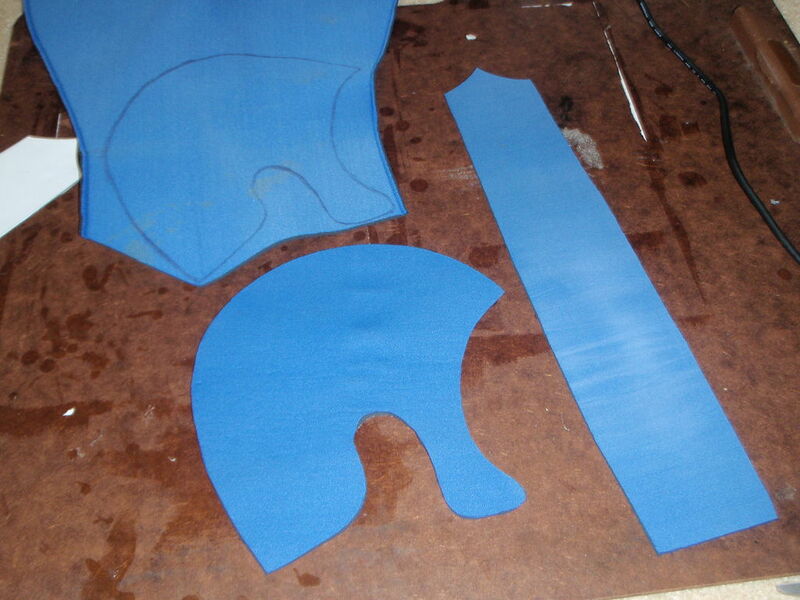 Also remember to make two of the side pieces, and to flip the template if you want the same color helmet all over. Neoprene is a bit tricky to cut, you need to have a pretty sharp pair of scissors. I suggest starting with the long skinny piece first just to get a hang of it before you have to do a bunch of curves on the two side pieces. Go bust out the sewing machine! Set it to a Zig-Zag stitch, and make sure it is at the widest possible setting. Also make sure that the stitches are set to be very close together. Go find some scraps of neoprene and do a test. Note: When you sew these together the fabric does not overlap or anything. I'm just placing them next to each other and letting the machine sew the two together with the wide stitch. If you don't have access to a sewing machine I suggest you follow this and use that stitch method. You want to start sewing at the front of the helmet first. Also, make sure that the colors you want are on the right sides. This helmet is reversible, but make sure you get the colors on the right side. Congratulations, you are now SUPER RAD! A few more things to add. If you read everything and added on that extra inch to the template, you will now probably want to trim off the extra flap hanging out the back of the helmet. If the helmet is too big/small for your head you can add a chin strap that attaches to the sideburns which will help make it fit better/keep it on your head. The first helmet I made was rather ill conceived, but the strap keeps it on my head even though it is way to large. I do plan to make at least one more Instructable on the mask + its template. Hope to see some more quality homemade costumes at the next concert. Thanks for reading. I finally got around to making the Mask Instructable. This might interest some people looking at this one. Thanks for a great set of instructions. Had to make five of these, and although it was tough to alter your pattern for a tiny 3 yr old head, it gave me a great starting off point! Thanks so much for taking your time to share! You are super rad!! Thank you so much for this! I need to make this and the goggles before my trip to California next summer! I know this project has been ip for some time, the last comment is in 2009, but O really wanted to share this. This instructable and the one for the mask made my little AquaCadet very, very happy for her fifth birthday! She wanted an AquaBats theme. I didn't have neoprene, we made it out of craft foam and yarn, but she loves them so much! Thank you for the instructable! Awesome! It's great to see The Aquabats influencing another generation of kids in such a great way! you look like ricky fitness! Woohoo! Super excited that the mask instructions are now up! Going to see The Aquabats! this Saturday and I'm making anti-negativity helmets for everyone in my group!! Awesome! I'll be going out to the show in LA on the 11 of February. Maybe I'll see some homemade helmets there, too! Now you need to build the belt and get a tight shirt!! if the op doesnt get to making a tut for the belt and shirt ill post it. im making at least the shirt tomorrow and ill take pics and such, and if i can get some nylon ill do the belt too. Heh, thanks for all the feedback. Go for it! I'm done with my Aquabats Instructables, and probably won't be making any more. "The fury of attack, feel the wrath of the Super Rad Super Rad Super Rad." ALL SYSTEMS GO, SOON THE WORLD WILL KNOW! The fury of attack, with this secret codename, applesauce, applesauce, applesauce. Super Rad! !